Over 1,000 illegal African immigrants refuse to return to internment camp, hold protest near Egyptian border. More than 1,000 illegal African immigrants in Israel staged a sit-in Saturday near the southern border with Egypt after a protest march against conditions in their internment camp, and called for help leaving the country. "We are going to stay near the border with Egypt until a solution is found so our rights are respected," a statement by asylum-seekers at the Holot camp in southern Israel said. The sit-in came a day after Israeli soldiers stopped the demonstrators, most from Eritrea and Sudan, nearly 300 metres (yards) from the border. The protesters, who are allowed out during the day, said in a statement that their march was in protest against their "inhuman and unlimited" detention at Holot. One demonstrator said the authorities present it as an "open facility", but it was "actually a prison". They ignored the rule that they must spend the night in the camp, which houses some 2,300 illegal immigrants, by camping out on the border. The demonstrators want to be able to leave Israel, and have urged the UN refugee agency and the international community to take charge of their cases so they can immigrate to a third country. Israel requires illegal immigrants who have been in the country for more than five years to live in Holot. Under legislation passed in December 2013, authorities can detain illegal immigrants for up to a year without trial. 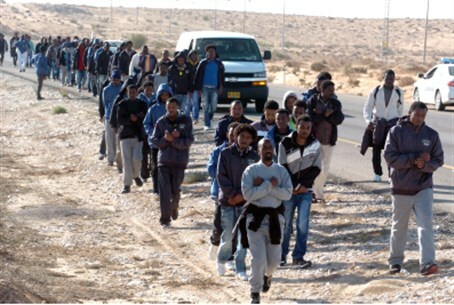 The Israeli population and immigration office said that in late 2013 there were 53,646 African immigrants in Israel, 35,987 of whom were Eritrean, 13,249 Sudanese and the remainder from other countries. Illegal immigrants have been blamed for a dramatic rise in violent crime in parts of Israel, particularly in working class neighborhoods of southern Tel Aviv were they are mostly concentrated. Israel's construction of an electric fence along its border with Egypt has reduced the number of immigrants arriving illegally through the Sinai Peninsula to almost none. But the question of how to deal with those who are already in the country - the vast majority of whom are economic migrants as opposed to refugees - has become a political point of contention, with leftist groups coordinating efforts calling on Israel to let them stay.